The internet Celebrity. Bob in Oz (ok, a little poetic licence). A Queensland based blogger. 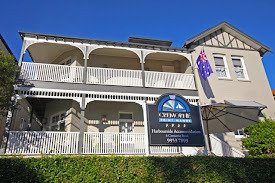 has recently stayed at the Cremorne Point Manor. He's written a review of the Manor and Sydney's North Shore. Being a Brit he headed straight for a pub. and managed to stumble upon the Sydney institution known as the Oaks. I'm sure he had a great time. Here is his review. Ok we didn't actually do this. It's a guest reusing our bottles. but isn't it sweet. Thanks to the Owens for sending this in.